The time of year is approaching where fresh basil will be grown in abundance & I can't wait! I love all things basil and this Pesto Cream Sauce is out of this world. It reminds me of when I traveled to Italy with a few girl friends of mine. We went to the local market in Florence, picked up some fresh handmade pasta, a block of parm cheese, cream & a jar of pesto and headed back to our apartment to make dinner. That was the first time I've ever had a pesto cream sauce and dang it was so good. I have dreamt of that pasta many times, hoping to someday recreate it. I am now dairy free and am delighted to say that I have discovered a way to make it so similar & so delicious that you wouldn't even know that it's vegan! 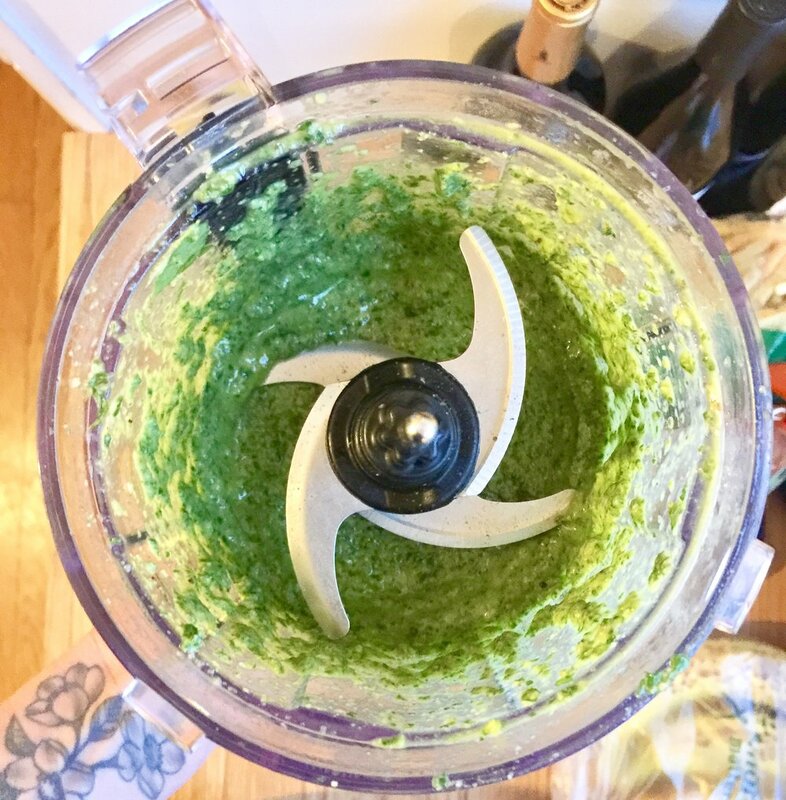 I combined homemade Pesto + my Cashew Cream Sauce to make a bright, flavorful & creamy pesto sauce. I can't say for sure but I have a feeling you will want to go back for seconds.... and thirds. Now let's open up a bottle of wine (a crisp Sauv Blanc or buttery Chardonnay would pair beauitfully) & get cooking! First things first, start by preparing your Cashew Cream Sauce - (Click to be directed to the Cashew Cream Sauce recipe) pour into a bowl and set aside. (No need to wash your food processor, you will be making the pesto in it too.) You will need approx 1- 1 1/2 cups for this dish. Refrigerate or freeze the remaining sauce for a future meal! This sauce is a two step process so first make your cashew cream and then make your pesto. I know it may seem complicated but it is actually super simple to make! See below for the pesto recipe. Combine basil, walnuts, lemon juice & salt in a food processor. While the machine is running, slowly drizzle in olive oil until the pesto is smooth. Pour into a bowl & set aside. In a medium stock pot bring water + 1 teaspoon salt to a boil. While your water is coming to a boil, in a medium/large skillet sauté 2 Tbsp olive oil, (onion/garlic till translucent if desired) & then add in the asparagus. Sauté until the asparagus are slightly softened but still crisp. Deglaze the pan with the 1/4 cup of veggie broth or white wine. Just let this hang out & simmer on low. Once your water has come to a boil, break capellini in half and add to the pot. Stir to ensure the noodles do not stick together. Cook the pasta until al dente, approximately 3 minutes. Now this is a super important step! DO NOT I repeat DO NOT ever drain your pasta water. It is an essential ingredient to all pasta sauces. I learned this trick from my girl Lidia on PBS Create and I am forever grateful. It makes me happy to now pass on this secret to you! So, using a pasta ladle or small strainer with a handle, scoop out the pasta directly into the skillet with your asparagus and broth. Using tongs stir the pasta allowing all the ingredients to mingle. Then add in your pesto and start with 1 cup of cashew cream sauce. Stir to combine. Add in the chopped arugula. Next, this is where your pasta water comes into play. Start with ladling 1 scoop of the hot pasta water to your pasta(approx 1/4 cup at a time). Stir with tongs to make sure all of the noodles are coated with the creamy pesto. If you like your pasta a bit more saucy, add more pasta water! If you feel it’s too thin then add in more cashew cream. Simple as that! Serve on a large plate or bowl & garnish with fresh chopped basil. Sprinkle on some vegan parmesan cheese if you have it! Bon appetite!